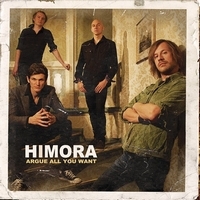 If you like 70s and 80s rock music then you should give the Norwegian Himora a chance as they have released their debut album. After playing together a long time it has not come to any records before this one. So we get 11 songs in the pop rock area with destination at the 80s soft rock music landscape. Most of the stuff is average country side rock'n'roll, but some of tends to be a little boring. The style could be influenced by bands such as Loverboy and Cars but still Himora give their personal dose of spray to their songs. The best and most listenable is Too Long At The Fair, a 80s rock grenade with bite and party rock attitude. Like A Heart Attack is also a song that catches the ear with melodic guitar rock'n'roll on the menu. I see Himora as a good band to play at smaller venues where they be in contact with the crowd, and their music has good concert elements in it, maybe that is some of the explanation they have not made an album earlier.